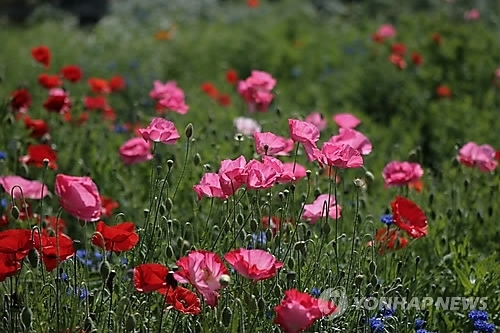 SEOUL, March 21 (Yonhap) -- North Korea is expanding fields of poppies for drug production as it faces difficulties in securing funds to maintain its regime in the wake of China's recent decision to suspend the import of North Korean coal, the head of a North Korean defectors' organization here said Tuesday. "In its early stage, the Kim Jong-un regime declared a war against drugs, getting rid of poppy fields. But now they are cultivating them again," Kang Cheol-hwan, president of the North Korea Strategy Center, told Yonhap News Agency over the phone. The hard currency safe of the North Korean government is rapidly drying up, although it is desperately trying to cope with the suspension of China's coal imports, he said. On Feb. 19, the Chinese Commerce Ministry took the step against the North's intermediate-range ballistic missile test. The punishment, effective until the end of the year, is sure to be significantly detrimental to the cash-strapped North as coal is estimated to account for about 40 percent of its total exports to China. "The North is cultivating poppy fields again for drug smuggling as a way to secure funds to manage its regime," Kang said, adding that the war on drugs has already ended in failure.